Here are our magnificent seven time management tips and tricks. 1. Prioritise your tasks into their order of importance, not by their likeability. 2. Use a prioritisation app to decide your priorities. 3. Concentrate on the task at hand. 7. Work from a list. You must prioritise your tasks, simply because you cannot do everything simultaneously and because not everything has the same importance. Failure to prioritise is the major cause of time-management failure. Prioritisation should be in order of value, NOT in order of enjoyment. Many people fail because they avoid tasks that they don't like. Prioritisation is not about likeability. Prioritisation is about a logical evaluation of the task, irrespective of whether the task is likeable or easy. Time management is about doing things in the right order, not whether the task is enjoyable or easy. Now we know we must prioritise our tasks into "the order of value" and "the proper logical sequence", we need a method which will allow us to do that. Our What'sNext? prioritisation app will allow you to put your tasks into the correct order. 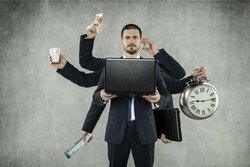 Be a better time manager by prioritising your tasks. Your mind can be likened to a magnifying glass, that can concentrate and focus your mental energy onto a single point, enabling you to burn through a lot of work in a short period of time. Alternatively, if your mind is unfocused, it fails to concentrate and focus its energy. Which means the energy is dissipated over many tasks and fails to do any serious work on any one of them. The greatest gift you can give yourself is that of concentration of mental energy. Learn to concentrate 100% on the object of your work, without distraction; you will then achieve much more in less time. Location; location; location. If at all possible, pick your work location carefully; for we are always affected by our environments. It is easier to concentrate and minimise interruptions if you are in a non-distracting environment. If you are surrounded by noise, people, hustle and bustle, then you will find it almost impossible to focus on the task in hand. Wherever possible, try and arrange things so that you have a quiet, calm and comfortable workplace, so that you can concentrate. Managing your time efficiently, will be easier in a less-stressful environment. Some people are continually lacking in energy because they don't eat well, don't sleep well and consequently don't work well. As a result, they are always struggling. If you are struggling to get all your work done, check your nutritional habits, your sleep habits and your work habits. Make the necessary adaptive changes and you will be a more effective time manager. All good time managers take good notes. They note down conversations, decisions, action plans, interesting questions, good ideas, and minutes of meetings. They don't trust their memory because memory is imperfect and limited. Instead of trying to remember everything, they get into the habit of carrying around a notebook and pencil. Like a detective. If you want to manage your time better, you should do the same. Most people have far too much to remember, to even attempt to remember everything. Those people who attempt to keep everything in their heads, drive themselves nuts trying to remember what it is they were supposed to be doing. All good time managers work from lists. They have checklists; they have protocols, aid memoirs, schedules, diaries, to-do lists, and action plans. They have everything written down. All the information is NOT in their head. Don't burn out your brain by trying to remember everything; instead, note it down and build lists. Work from a list and be a better time manager!